This section gives some hints and tips for walk leaders and will be of particular use to new or aspiring leaders. Without leaders, there would be no walks and we are all very grateful to those who put in a lot of hard work planning, recceing and leading walks for the group. We are always looking out for new people to come forward as leaders, so if you fancy having a go, talk to some of our more experienced leaders, any of whom would be happy to advise you. It's understandable that you may feel a bit nervous about leading your first walk, but if you'd like support some of our existing leaders may offer to co-lead a walk with you which will help to build up your confidence. The Ramblers Association website contains masses of useful information to help walk leaders. The RA has also produced a Walk Leader's Checklist on a handy A6 size card. We have a supply of these cards if anyone would like one. Location of the walk - distance from Milton Keynes - is it feasible for everyone to get to the start of the walk independently or would it be better to meet locally and share transport. Length of walk and how long it will take to walk it. This may depend on the time of year and hours of daylight available. You also need to bear in mind, that everything will take longer with a group of people as stiles and other obstacles will slow people down. As a general guideline, allow 2 - 2½ miles per hour including breaks. Meeting time - again dependent on how long you estimate it will take to complete the walk. Remember to allow time for getting to the start point. Circular or linear - if it's a linear walk you will need to work out the logistics of transport. If you are planning to use public transport check train/bus times in advance. If using cars, you will need to make sure there are enough cars to transport everyone from one end of the route to the other. As a general guideline, count the number of people and divide by 2. So, if there are 12 participants, you will need 6 cars - all cars drive to the end of the walk, 3 are parked there while the other 3 return to the start with all the people. When you have finished the walk, the cars at the end will then transport people back to the start to pick up the cars parked there. Terrain - whether it's a walk around the redways of Milton Keynes or a long trek in the mountains of Snowdonia, choose an area that you will feel confident in being able to navigate, whatever the weather. Bear in mind the amount of ascent and descent, whether paths are well maintained, number and type of stiles, river crossings and other obstacles. If at all possible, it is advisable to recce the whole of your walk in advance. Investigate suitable places at the start (and at the end if linear) for car parking. Check that your route keeps to public rights of way, unless in open access ground and make a note of any difficult areas for navigation. You may also wish to choose spots for coffee / tea and lunch breaks and check facilities such as toilets, pubs or cafes. It's a good idea if you can, to ask someone to accompany you on the recce as two heads are better than one and your companion may agree to be backmarker on the day. If you notice any obstructions or problems with footpaths, make a note of the location and report the problem to the Rights of Way Officer on the local council or speak to our Footpath Secretary who will be able to advise you on what action to take. You may also wish to plan a shorter "escape route" in case anyone has problems, though this is not always practicable. Unless you know the route extremely well, it's advisable to take a map and compass, even when using written instructions from a book. If you have a GPS, you may prefer to use this. You should also have a first aid kit in case of emergencies. It may seem obvious, but make sure that you have the right gear for the terrain and weather conditions. A stick or secateurs can be useful for clearing overgrowth from paths, particularly on your recce. There may be non-members or newcomers on the walk, in which case a supply of spare programmes and membership leaflets can come in handy. Arrive early at the meeting place and welcome everybody. Check that all walkers have suitable equipment - you are entitled to turn someone away if you feel they are inadequately prepared for the expected conditions and may be putting themselves or others at risk. 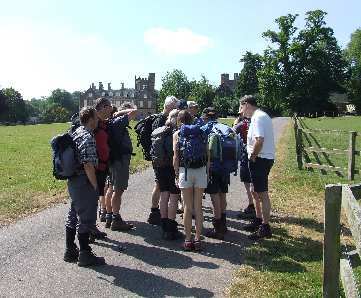 Introduce yourself and give a brief resume of the walk, mentioning any points of particular interest and arrangements for lunch and refreshment stops. Give an approximate return time. Make a head count and appoint a backmarker if you feel it's necessary, bearing in mind the number of participants and type of terrain. During the walk, keep near the front so you can steer people in the right direction and make sure you can see the backmarker. Set a reasonable pace, but keep an eye on the group to make sure people don't get too spread out and check that no one is struggling. You may need to slow the pace down a bit if people are having difficulty in keeping up. At rest breaks, let people know if there are toilets or other facilities nearby which they may wish to use and give a 2 minute warning that you are about to continue the walk, so people have time to repack their bags, etc. RA members are covered by civil liability insurance, which protects leaders against claims for damage to property and injuries which may occur on the walk. For more details, see the Ramblers Association website. If you are unfortunate enough to have any incidents / accidents on your walks which might involve a claim on our insurance, please make a note at the time of all relevant details, eg personal details of those involved; when, where and what the incident was, and statements from witnesses if appropriate. Then report it to the secretary as soon as possible who will pass it on to the insurers as necessary; if in doubt, give him a call. Please note that incidents caused by dogs are not covered by the RA insurance policy. It is important to provide sufficient information to enable the other members to decide whether or not your route is suitable for them from both the distance and terrain point of view. To minimize the work required to generate the programme every effort is made to use your words as provided to the Programme Secretary or as entered in the calendar below without change. A number of automated procedures have been developed to help with this; hence providing information in the format indicated below is of considerable assistance. In addition volunteers are now adding our walks to the National Ramblers Walks database for which a slightly different format is needed, but having all the data suggested below makes their job a lot easier. If you are uncertain about some of the information or how much detail is needed then a phone call or email to the Programme Secretary will soon provide assistance. The meeting time - note that if using the calendar below the time is automatically put in to the programme in bold with the date so there is no need to repeat this in the text. Approximate distance of the walk and whether circular or linear. Meeting place - in addition to a place name or description, an OS Grid reference is always desirable and should be in the form (GR SP887355), including the brackets to enable our software to identify it. However, with the increasing use of in car Sat-Navs a postcode is often useful and links for converting OSGB to Postcodes and vice-versa are Streetmap, Gridreferencefinder and Nearby. If you do add a postcode however, please make sure it is where you intended by checking the conversion back into a grid reference as, particularly in country areas, we have found some considerable discrepancies in the past. If the meeting point is outside MK then the Walk Finder database would like to know the nearest town. If you are planning to meet locally to arrange a car share before leaving for a more distant walk consider providing the location of your walk starting point and time so members can have the option of meeting you there which can possibly save some lengthy trips across Milton Keynes only to return past their doors. It is hoped that members taking this option will make a courtesy phone to the walk leader to tell them of their intentions. If no obvious car parking is available at the meeting point a comment as to the best place to leave a vehicle close by is useful, remembering that parking may well be more difficult than when you did the recce. A general indication of the route by way of villages or landmarks to be passed and some details on the type of terrain so that members can make a sensible judgment as to its suitability for them. Arrangements for lunch and refreshments etc - although within MK Ramblers we do not normally stop at a pub for lunch an indication of the availability of one, or a tea room, at mid day or the at the end of a walk is helpful. Whether dogs are allowed or not - this is entirely at the discretion of the walk leader and may well depend on if the route is through fields with livestock and the time of year. The earlier you can provide details to the Programme Secretary the better as it enables the programme to be prepared in plenty of time and potential gaps identified. You can also submit details online by using the Calendar at the bottom of this page - clicking on a date will open a new window for you to fill in the information required.